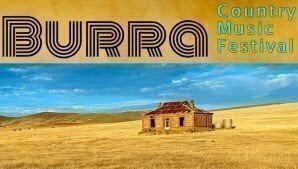 Click to view any upcoming events by Burra Country Music Events Inc.
Pete Smith (QLD), Peter Coad & The Coad Sisters (NSW): Jim Hermel (SA) Tracey Rains & Claypan (SA): John Turner Jr (SA) Melissa Pruesker (SA). Tyler Paterson (SA) Rock & Roll Demonstration on Friday Night. All artists will have their merchandise for sale at the event and will be available for autographs and interviews. - All attendees require a valid ticket to gain entry to the Festival. Please print your ticket/s (or show them on your smartphone) and present them on arrival for scanning. - Tickets are non refundable but are transferable to other people. - Family tickets provide entry for 2 Adults and 2 Children (aged 14 to 17 years). - Children under 14 are free when accompanied by an Adult. - Children must be supervised at all times. Friday: Food stalls will be available from 6pm and all of the weekend for food & Drinks. Licensed Bar Friday & Saturday NO BYO Alcohol allowed. Jasmine Rae (Saturday night only) Jasmine Rae is becoming recognised as one of Australia's premiere vocalists and entertainers. The three-time ARIA nominee, nine-time Golden Guitar nominee, two-time CMC Music Award winner and CMA Global Artist Award winner has become a main-stage favourite at major festivals across Australia with her dynamic and critically acclaimed live show. Saturday: Meals, Snacks, Tea, Coffee & Soft Drinks are available at reasonable prices. Parking is free and secure, and there is plenty of parking spaces in the showgrounds, as well as out. There is camping on-site at the showgrounds with unpowered sites available for $10 per site per night. Brought to you by:Burra Country Music Events Inc.